After leading a year of monthly visits for teens from LEAP to see PEM’s special exhibitions, I closed the year with this mural project at their Teen Center. 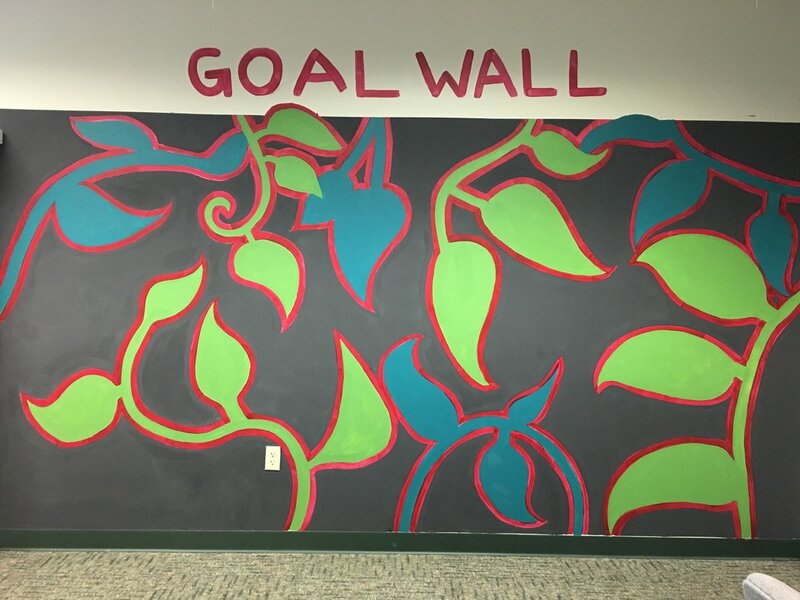 We took the idea of the goal wall from an existing paper that was tacked to the wall, and designed a permanent installation where people could prominently and pridefully write their goals. 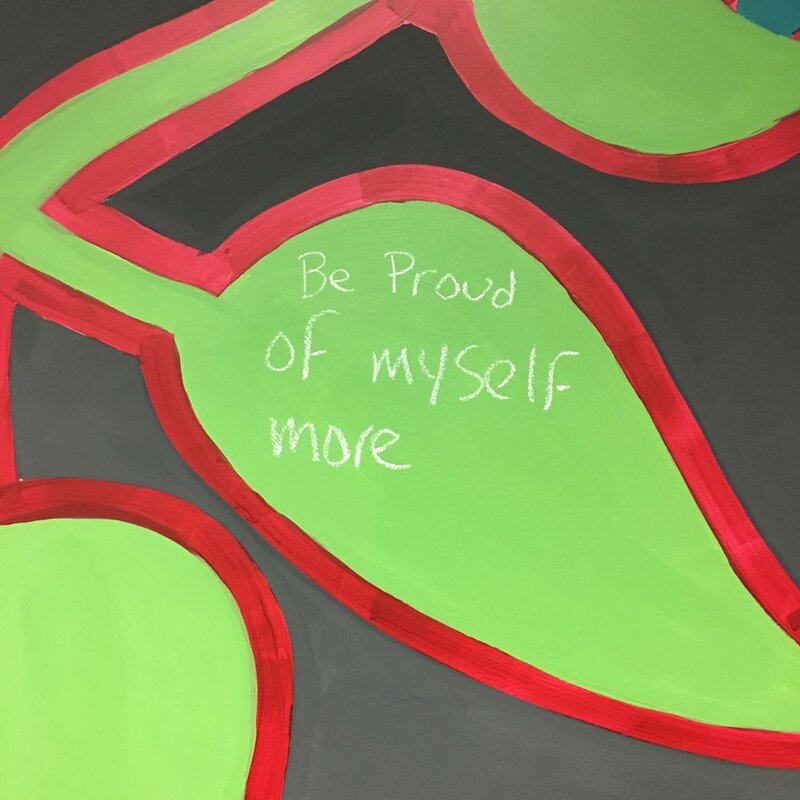 The entire mural was done in chalkboard paint so both the leaves and negative spaces are usable and easily updated. This participatory web building piece was inspired by PEM's exhibition Wild Designs, an exhibition about biomimicry. It was developed for a family night celebrating PEM's school partnership program, Creative Collaborations. For two hours, the web was full of children experimenting with engineering and building the web. In spring of 2018, I developed this participatory art project for Katie King's fundraiser for Punto Urban Art Museum in Salem, Massachusetts. Katie and her daughter provided the theme and color palette. Guests were invited to "give some love" by contributing a heart to these two canvases. Templates of various styles were available to trace, and they had the option to freehand. Towards the end of the event, I unified the two canvases by doing a background treatment. One of my community partners while managing ArtLink at PEM was Pequot Highlands Housing Community. At the start of the winter in December 2017, I went to their site to help their kids make a winter-themed window display. They created the scenery, learned how to make a paper chain, and they showed each other how to make 3D snowflakes. Their next field trip to PEM was their best attended ever. This is one of a few activities that I developed for my program's first ever exhibition and family night. Each activity drew on the exhibitions that program participants had experienced at PEM that year, including Lunar Attraction, which focused on art inspired by the moon. For this photo booth, instead of simply providing space-inspired props, event guests were invited to create their own space gear in addition to some key pieces that I created to get them started. For my first act as a new auntie, I threw a baby shower for my sister, seen here looking fabulous. I created cat-shaped templates and provided gold gel pens for guests to write their wishes-for-baby. Completed wishes were displayed on a line with pink clothespins. Under the guidance of muralist Munir Mohammed, a group of students at Rhode Island College designed and installed a mural in the Adams Library onsite at RIC. I was the Teacher's Assistant for this course, and took the lead on the research and design. We selected samples of writing systems from throughout the world, and arranged them with the earliest writing systems toward the center (for the most part), and the more contemporary systems at a larger scale towards the edge. Ben Rittmann, Julian De La Garza, James Sundquist, and Kelly Goddard were also a part of the collaboration. In this early mural project of mine, I proposed mural ideas to the schools principals and installed them with students enrolled in Providence After School Alliance's AfterZone. The stage idea was based on conversations with the school's principal of the time, and the painting for both projects were done almost entirely by the students. My painting style and my approach to developing ideas with students has evolved since these, but they were still important experiences for myself and each of the students who contributed.